EDINBURG — A season ago, Gysell Zayas was a major cog at Tyler Junior College, recording 356 digs as a sophomore. Now, Zayas is a junior with UTRGV and again in a vital role helping the Vaqueros jump out to a 3-0 conference start. The Vaqueros completed a perfect six-game homestand on Saturday afternoon at the UTRGV Fieldhouse, sweeping Chicago State 25-8, 25-21, 25-18. Zayas has 66 digs in conference play and rarely comes off the court. UTRGV has been a well-oiled machine, outscoring opponents 18 games to four during the undefeated homestand. Zayas, a native of San Antonio, said her strong play revolves around wanting to make the offense run smoothly. Even though Zayas was slow to take credit for her own game, Vaqueros coach Todd Lowery was eager to assign it. He said that she has been the most valuable player on the court on a few occasions. Lowery has been a positive impact since taking the reins of UTRGV two seasons ago. The 2016 WAC Tournament championship was a product of that impact, but his influence also extends into the recruiting process. He credited his assistants for helping contact and attract a talent like Zayas. Zayas said the move was an easy decision after her visit to the Valley. UTRGV sports five women from within the state of Texas. 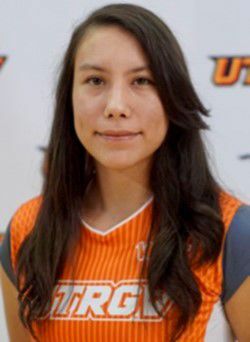 Serbian players Bojana Mitrovic and Tina Sekulic followed Lowery from the University of Texas Brownsville, where he coached before taking the position with UTRGV. The Vaqueros are already reaping the benefits of Lowery’s recruiting this season. Freshmen Veronika Jandova and Debora Nazario have stepped into prominent roles. Jandova has led the team in blocks four times, and Nazario has been the team’s assist leader on five occasions. Sophomores like Julia Moctezuma and Paulina Ramirez are getting game action and learning from the starters ahead of them. Moctezuma, a Houston-area recruit, says practice has been about making sure the Vaqueros vary their offense. Lowery echoed the focus on being an unpredictable group to play against. The Vaqueros will now take their show on the road against Utah Valley and Seattle University.